This morning, along with Cam Davies and Heather Hennessy, I was on a panel discussing marketing metrics and return on investment. 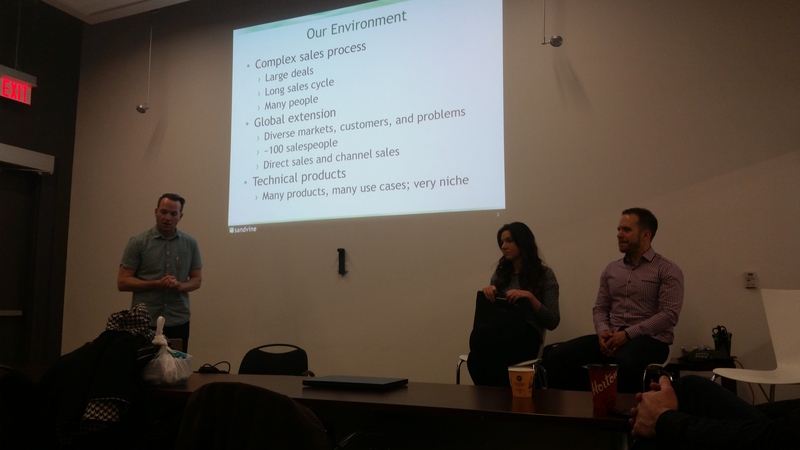 This session was with the Strategic Marketing P2P group hosted by Communitech. We each had 15ish minutes to present our thoughts on the subject, and then for the last 15 minutes or so we fielded questions from the audience. It was a fun and insightful morning – read on for a summary of the presentations, and assorted notes and thoughts. We presented in the order in which we’d randomly sat down on the elevated panelist chairs, so Cam led things off. Cam is the Marketing Manager at Miovision, a local company that is playing an important role in reducing a bane on many a commuter’s life: vehicle congestion. I’ve chatted with Cam a few times before to exchange marketing ideas, and have found him to be very thoughtful and analytical, so I was excited to hear his presentation. In fact, I’ve written about the importance of knowing the company objectives on a couple of occasions (see here, and here), but just didn’t think to include that in my slides. So kudos to Cam for raising a vital point and setting a great foundation for Heather and myself. Cam built on that starting point and illustrated some valuable metrics with some specific examples from his own experiences: how he’d built a market share/penetration analysis that was having direct influence on where sales and marketing investments were directed; and how Miovision has been consciously increasing their community awareness, and how they measured the progress and success of that initiative. Cam closed by emphasizing that it’s easy to get lost in the flood of marketing metrics (man, just Google it sometime and you’ll find Buzzfeed-style articles like “57 marketing metrics that will change your business!! !”), so it takes discipline, analysis, and experience to choose the meaningful ones. Heather is the Manager, Strategic Marketing Programs at Desire2Learn (D2L), which is based in Kitchener. I hadn’t met Heather before, so had no idea what to expect from her presentation. Conveniently enough, Heather had chosen a different focus for her segment: she focused on being results-oriented for communications activities. She discussed the importance of measuring returns on different marketing channels, and how trimming the underperforming channels and tactics is part of the overall optimization process. She also spent time on the importance of knowing what actually matters, and not being distracted by neat things that actually don’t mean much (for instance, if you draw a thousand people to a webinar – that’s great – but what matters is how many leads you created). As the Director, Product Marketing at Sandvine, I’m involved in quite a number of marketing activities, and, to a large extent, I set many of our overall marketing strategies. Plus, I’ve been in technology marketing for more than a decade, so I’ve seen and done quite a bit. Consequently, the challenge for me in prepping my slides was choosing what to include and what to omit. What metrics matter to us when we release a new Global Internet Phenomena report? Thanks to Dan Deeth for contributing to this part. My hope was that these examples would show the diversity of metrics that mattered, and how the actual return on marketing investment is a complicated beast. True to usual form, I included two references to The Simpsons. As I usually do in such situations, I tried to build on what the previous presenters had said, and the points that they’d made. This proved quite easy to do, as their points were very solid and well-articulated. In general, we presented three unique perspectives that shared common philosophies of understanding objectives, measuring what matters, and avoiding distraction. Most of the Strategic Marketing P2P sessions have a single speaker. This model works well, as you get to hear an expert go into depth on a subject, but it also means that you’re really only hearing one perspective, one point of view. The downside of the panel is that you get a shorter time with each presenter; the upside is that you hear different perspectives. For the younger professional in the room, I think the diversity of perspectives is very important, as it will prevent them from falling into a trap of thinking that there’s a one-size-fits all solution to the challenges associated with finding meaningful marketing metrics. 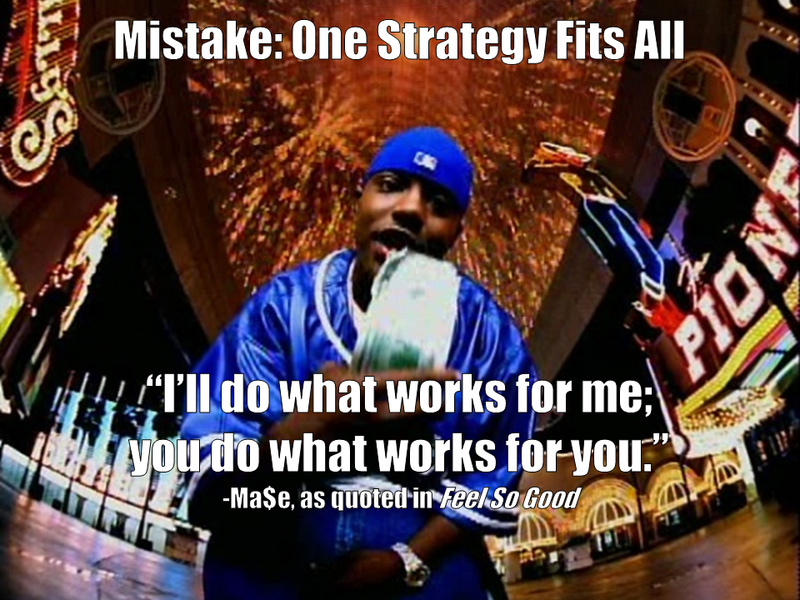 Related factoid: the last two presentations I delivered at a Communitech event both closed by quoting a rapper.